Through the 1970s, Batman fought evil every month side by side with DC's greatest heroes. 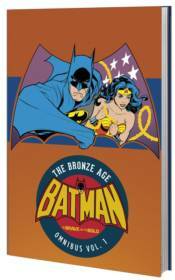 Guest-starring Wonder Woman, the Phantom Stranger, Adam Strange, Black Canary, the Teen Titans, The Flash, Green Arrow, Aquaman and more, these stories are collected in a single, massive hardcover for the first time. Collects THE BRAVE AND THE BOLD #87-122.